The concept of a Permit Inspection was initially developed and adopted as part of the 2011 Florida FR/BAR Residential Real Estate Sales Contract. The primary reason for its inception was to help shed liability from agents involved with residential sales transactions and to also shed liability away from property sellers/owners who may be unaware of permit issues related to their property that could become a liability for a new owner. The FR/BAR residential sales contract makes it the sole responsibility of a “buyer” to determine if any issues exist with the property being sold that relate to needed permits for the specific use of a property, or for improvements/building that have been made to the property. Identification and location of a subject property is the most important aspect of a Permit Inspection. It is essential to confirm exactly where a property is located, then to identify the Jurisdictions Having Authority (JHA) over the property since the authority of governing agencies run with geographic boundaries. The relevant JHAs are the government agencies ( local, state, or federal) which control permits for a particular geographical area. JHAs have legal authority to allow or deny changes to a property, its use, or physical improvements upon it. Additionally, JHAs have the authority to force a land owner to comply with, remediate, or remove unauthorized physical improvements. Additionally, JHA’s can force a land owner to cease the use of a property if not properly authorized. 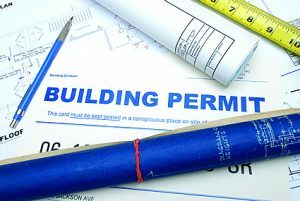 Furthermore, costs and fines related to infraction of permit requirements may become the responsibility of a new property owner, even if that person was not informed of or made aware of such infractions. In the most extreme scenario, a home owner could be required to demolish a entire structure, or part of it, if it was not properly permitted and approved by a JHA. While this is an extreme example, it demonstrates the liability that can fall upon a new property owner if existing buildings or land uses were not properly authorized by JHAs. A JHA is an entity or body, private or public, having regulatory control and authority over a specific geographical area or property. An open permit is an approved permit that has not been finalized or closed, and which may still has time available for its completion by the entity that originally requested the permit. A permit is required and issued to allow a regulated change or activity to commence on a property that is located within the geographical area controlled by the JHA. The initial permit is required to be reviewed and approved by one or more JHAs before any work activity may commence. Once the permit request is approved, the permit is then “open” for work to commence. A specific period of time is allowed for each permit to be started and completed; six months is typical, but it can be for more or less time. It is incumbent upon the initiating contractor and/or property owner to ensure that work activity has interim reviews as required by the JHA. When all work is complete, a final review and approval must be submitted to the JHA to close a permit and make it “final”. In situations where work was approved to begin, but has no documented interim or final approvals, the permit remains in “Open” status until a final permit is approved and signed by the JHA, or until the time limit for the permit expires. An open permit can be a problem when work was completed but did not have proper interim or final review by a JHA. Such may indicate a lack of code compliance or failure to have proper interim reviews. Additionally, most JHAs require the original contractor who requested a permit to also complete the permit, which is a problem if a specific contractor is no longer available. An expired permit is a permit that was initially approved by a JHA for work to begin. But then, the time period allowed for its completion expired prior to a final review and approval of the work identified in the original permit. In some case, an expired permit might have no work completed at all, and in other case all work may have been completed but no final approval of sign off from the JHA was obtained. In such cases, depending on the specific issues, a new permit may be required and more work required, or the extent of work completed may have to be demolished and entirely redone. Typically, we make considerable efforts to identify all the JHA over a subject property. Based on identification of the JHAs, we then make inquiries to each to determine if any “Open” or “Expired” permits exist on the subject property. Additionally, based on our visual inspection of the subject property, we identify both land uses and physical improvements that may constitute “Unpermitted Improvements”. The scope of our permit inspection service is limited to visually identifiable components and land uses apparent and visible during our inspection. We are not responsible for omissions or errors made by any JHA, nor are we responsible for delays to inquires we make to JHAs. We are not responsibility for information that JHAs do not provide to us prior to release of our report; verbal or written. We are not responsible for any records that were not available, known, or provided by the JHA at the time of this report.